Adam Zebediah Joseph is a SAG / AFTRA (Screen Actors Guild / American Federation of Television and Radio Artists) and AEA (Actor's Equity Association) professional actor, self-taught artist, and author from the Untited States. He has always immersed himself in many creative pursuits including appearances in theatre, film, and television as well as performances as a dancer and musician, however, visual art has always remained one of his most notable interests. He has sold works to many private collectors around the world. His work has also been selected to appear as part of the set decor on national television for ABC Studios in California. His talent has been recognized in the UK and he has recently had his first book published, Lillee Can Be . It is a gender equality book available in paperback and e-book at booksellers worldwide including Amazon. 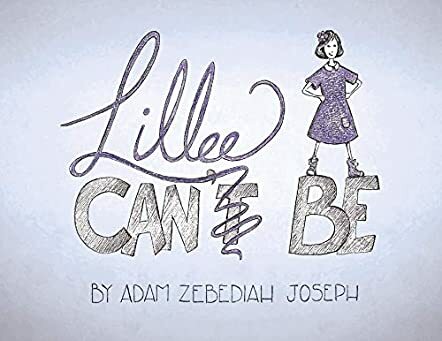 Meet little Lillee, a smart and playful girl in the storybook Lillie Can Be by Adam Zebediah Joseph. Lillee has a twin brother and they laugh, sing, and play games with each other. Whether it is jumping rope or riding a bike, they do everything exactly the same. They both are silly and funny and when they run to school it is always a tie. Lillee is never last but whatever they do at school, whether it is running a race or reciting poetry, her brother gets cheered more than Lillee. Though they are twins and identical in all ways, Lillee is always treated differently. The book tackles the topic of girls being treated differently from boys, even if they can do all that the boys can do. Girls are entitled to equality and success, just like boys, and I like the manner in which the author handles it through the story of Lillee and her twin brother. The illustrations are adorable and they make the concept and the message clear to young readers. Many young readers will be able to identify with Lillee's plight and this book is an encouragement for them to realize that their gender should not stand in the way of their success and that girls can do what boys can do. It is a good storybook for read aloud sessions in classrooms and at homes to help children understand that gender does not play a role when it comes to success.